For decades, neurologists had known that damage to the hypothalamus - including that seen in the mysterious post-World War I epidemic encephalitis lethargica - resulted in marked sleepiness. 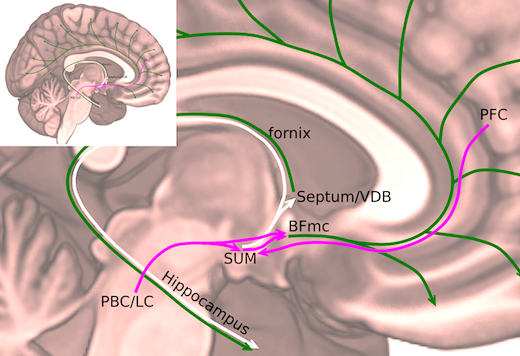 Diagram showing the supramammillary nucleus (SUM), whiich is part of the hypothalamus, in the human brain. Courtesy of Nigel Pedersen. The results were published on Friday, November 10 in Nature Communications. Genetic manipulations also allowed the scientists to determine that the brain chemical glutamate was critical for wake signals. When the gene for a glutamate transporter VGLUT2 was snipped out of the supramammillary nucleus, artificial stimulation had no effect on wake and sleep. The presence of the enzyme nitric oxide synthase was used to identify an especially potent wake-promoting group of neurons, but their functions still depend on glutamate release. The role of the gaseous neurotransmitter nitric oxide in this brain network is not yet known, Pedersen adds.